According to a report by 9to5Mac, Ikea's long awaited Symfonisk series of Sonos speakers will start at around $120 (£90 / AU$170). 9to5Mac claims that it has seen a poster intended for Danish staff announcing that they will be entitled to a free speaker, in celebration of "the company's 50th anniversary in the country." Although they didn't provide an image of the poster, it apparently says that between July 1 and August 1, staff "will be able to redeem [the] voucher in order to get [a] SYMFONISK Wi-Fi-speaker in white or black", and that "the speaker has a value of [DKK]799." The poster also reportedly says that "the speaker can be placed horizontally or vertically or hung on the wall as a practical shelf", which confirms rumors that the range will include a wall-mounted speaker. Sonos' current range of speakers start from $179 (£179 / AU$299) with the Sonos One, so it looks like Ikea is offering a more budget-friendly way of owning a Sonos speaker with the new Symfonisk range. If the speaker in question does cost $120, it's likely that it will be the cheapest one of the range, but we won't know for sure until the Milan launch event in April. 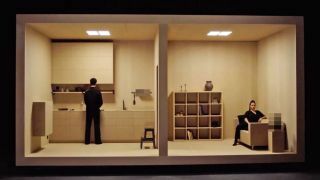 A video that was recently released on the Ikea newsroom teases the new Symfonisk speakers, showing a revolving room with the speakers themselves pixelated. Although we can't make out any of the finer details, it looks as though the range could include a smaller bookshelf-style speaker as well as the wall mounted speaker – of course, we can't be sure until we see the speakers in their un-pixelated form.